I had stiff levain in the refrigerator and wanted to use black sesame seeds. I was looking for bread to put it in. As you know my latest book had arrived. I found Pain au Levain. 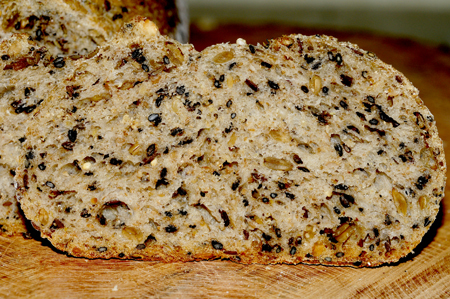 I like to use white or black sesame seeds in our food. I make my own tahini (ground hulled sesame seeds), put it in muffins and cakes, sprinkle grounded sesame seeds on my rice or add it to roasted vegetables. But, today I want to use black sesame seeds in bread. And whenever I can I will add some sunflower kernels too. 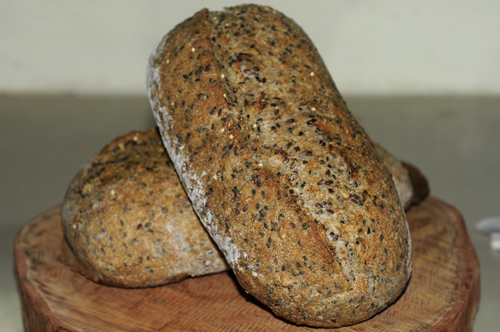 The result is delicious; the crumb is soft, moist and the crust nice crunchy. The loaves disappeared so quickly, we had them for breakfast and our light dinners. Even though the taste of the seeds is noticeably present it goes well with a lot of our favorite spreads like cheese, jam, guacamole, egg, and so on. This one will be back! The final dough: I added all of the ingredients, except salt and the levain, in the mixing bowl of a spiral mixer and mixed until all was well combined. In the mean time we had breakfast. After 60 minutes I added salt and the levain. I mixed on second speed for 2 minutes. At the end of mixing time I added the sesame seeds and the sunflower kernels until incorporated. The dough should be supple, with a medium gluten development. Shaping: I divided the dough into two pieces and loosely pre shaped into balls. Covered with a towel and left for 15 minutes to rest. I gently but firmly formed them into batards. What did you bake this month? 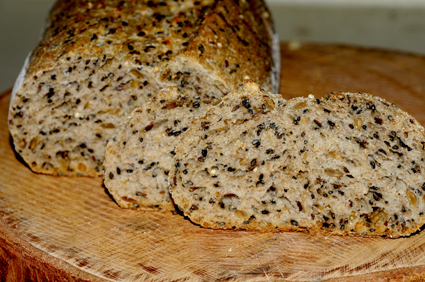 I love any sort of bread studded with beautiful seeds...and sesame seeds are my favorite lately. The combination of the black and the white is just beautiful! Hi Heather, we love it too. And it taste so great.